So, the new year has arrived and you want to get in shape. The trouble is, you love the Internet (perhaps a little too much) – how can you stay online while keeping fit? Luckily there are quite a few ways, from exercising at your desk to apps that combine working out with online social features. If you really can’t drag yourself away from your computer, why not exercise right at your desk? 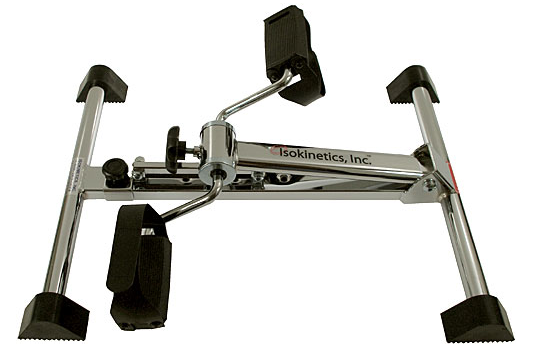 Isokinetics Pedal Exercisers allow you to stay physically active while you work by keeping your legs moving. If you’re worried that moving a mouse around and typing isn’t a good enough workout for your upper limbs (hint: it’s not), you can move the equipment onto the desk and give your arms a quick go on the pedals while you keep an eye on your screen. The manufacturers say that regular use will improve circulation, muscle strength, joint range of motion, and coordination. If money is no object, the $4599 Sit-to-Walkstation could be the perfect choice for working out while you work. 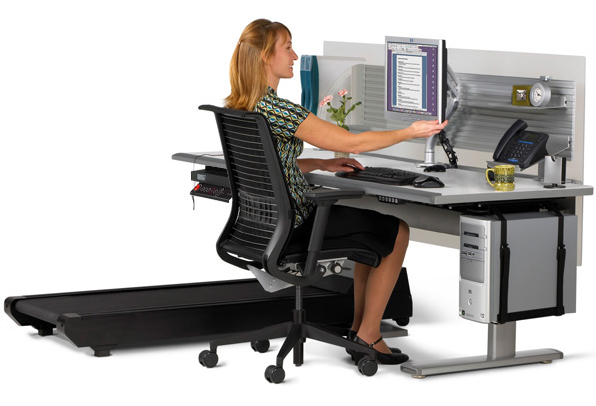 Combining a treadmill with an office desk, its height can be adjusted to standing level, allowing you to keep moving without leaving the office. Then, when you need a rest, just readjust the height of the desk and place a chair next to the treadmill. An attached console shows your speed and calories burned, plus the time and distance you’ve covered. This is definitely in the luxury bracket but if you have the spare cash and the will to keep fit without stopping work, it could be worth the investment. If you’d prefer to get out of the house and into the gym, the SurfShelf could be just what you need. 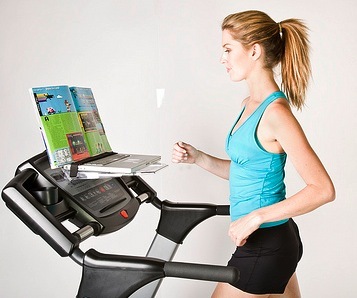 Clipping on to many treadmills, cycle and exercise machines, it lets you rest your laptop while you gently walk, jog or cycle. We wouldn’t recommend doing an intensive workout while you check your email, but if you’re just interested in keeping moving while you work it could be exactly what you need. As we mentioned in our previous coverage of the product, one reviewer described it as “One of my favorite inventions ever”. The Withings Scale does more than just tell you what you weigh right now. This 21st Century scale ties into an online service that keeps track of important stats like your body mass and fatty mass so you can see how you’re progressing in your quest for the body beautiful. You can view your latest figures in a browser or via an iPhone. What’s more, real over-sharers can set this WiFi-enabled device to automatically tweet out their weight each day. While that might seem a bit like Too Much Information, it could be just the encouragement you need to keep at it. After all, you don’t want your followers seeing you fail, do you? Daily Burn is a website that lets you to keep track of your calorie intake and other nutrition information along with customised training plans. Motivational groups let you compare your progress with, and set challenges for, other people. Meanwhile, the service’s iPhone apps let you to log your training progress, check nutritional information of food you eat using barcode scanning and take part in ‘Push up wars’ against others. 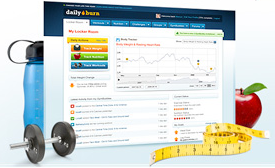 Daily Burn membership costs $9.99 per month, although there’s a free 7-day trial period. A number of apps designed to help you keep fit while sharing your progress online are available for most mobile platforms. 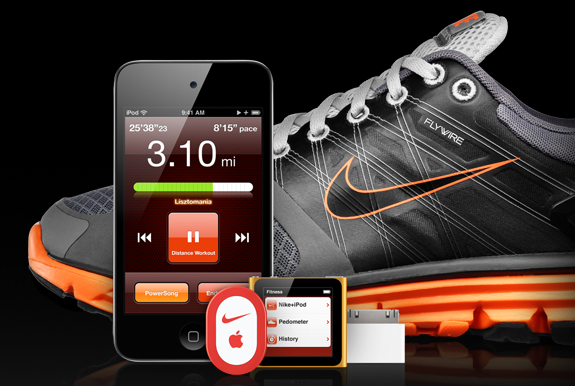 If you have an iPhone, iPod Touch or iPod Nano, the range of Nike+ apps are designed to track your progress and keep you motivated by using a sensor in your running shoe and music that can be set to reflect your pace and push you onward. After your workout, you can share your results online or just keep them to yourself, comparing your performance over time. Other useful apps include Runkeeper for iPhone and Android which offers similar social fitness features and lets friends track your progress in real time on a map. The Pro version of Runkeeper is free throughout January so it’s worth downloading it, even if you don’t think you’ll be using it in the longterm. Endomondo is another competitor and is available for a large number of handsets including iPhone, Android, Blackberry and Nokia. 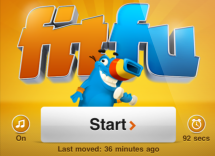 Another way to stay active at your desk is with FitFu. This iPhone app gives you small exercises to do regularly wherever you are, tracking your progress with the handset’s accelerometer. A social element to the app allows you to compare your progress with friends’, whether you just want to cheer them on or compete for points. Yes, FitFu gives you a score and you can “Level up” the more you keep using it. The app is currently on offer for the reduced price of 99 cents, so grab before 4 January to take advantage of the discount. Meanwhile, GymFu offers a range of mobile apps that offer a similar experience but concentrating on individual exercises – pushups, pullups, crunches and squats. If you have any more tips for staying connected while you keep fit, leave a comment and let us know. Read next: Can you love apps a little TOO much?